This is Max. 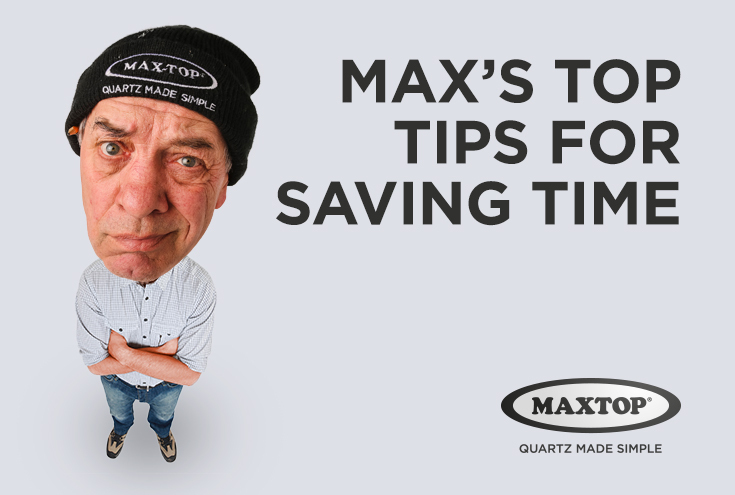 He’s been in the building trade for 7 years now, and he’s also a pro at fitting Maxtop. Today he’s sharing his wisdom on how to save time and make the most of your work day. Time is money, and although it might seem like a load of nonsense to some of you, getting organised will save you time, fill your wallet and might even sort you a couple more hours kip in the morning if you do It right. You’re not gonna last as a proper tradesman if you can’t find you’re a**e from your elbow every morning, it’s as simple as that. If you’re a self-employed installer you can’t afford to be wasting time with unnecessary rubbish, especially when it’s easily avoided rubbish. It doesn’t take a genius to work out a more efficient day of work means more jobs get done and saves you more time for catching up on the footy when you get home. Here’s a few of my suggestions to save you time and make your work days a bit smoother, so do yourself a favour and listen up. First things first, to make sure everything’s running smooth you need to know how much time you ought to be spending on each job. You can’t tell if you’re wasting time if you don’t have a clue what your plan is. Let the computer do it for you, there’s a load of ways to make spreadsheets and charts easily, just plug in your jobs and how much time you want to spend on them to make sure you’re making the most of the day. Be sure to account for a few brew breaks too though. All in all, if you’re checking everything daily you can see how you’re getting on and you’ll notice where you need to pull your socks up and get a bit faster. You know how it is, we’ve all been guilty of this one, you get to the gaff and get ready to crack on only to find your van in a state and you’ve gotta waste half an hour sorting it out. This is rule number one really; all you messy buggers, keep the van in check. Keep different sections for different kinds of jobs, so try hanging what you can to the walls, celling and doors, and most importantly, make sure you’ve got a light in there! Take 5 to check it over when you get back at night and make sure you’ve got easy access to anything you need for the next job. In other words, don’t s**t where you eat, keep it tidy and you’ll see the difference. Making sure everything is planned for the week, or even the month, ahead is always a top idea. At the end of the day, you’ve got to please the customers, and the last thing you want is to get cracking with a job and realise you don’t have the right gear for what they’re after. I make a point to scope out the spot and have a proper chat with them about what they’re going to need. You never know what they might spring on you at the last minute so it’s best to make sure you’re not gonna get any nasty surprises. The oldest trick in the book; you’re already feeling like a day off then your drill breaks… it’s not meant to be. It’s the perfect excuse to get home and watch Bargain Hunt. Nah! It might seem like a pain splashing out every few months for new gear, but it’s important you keep on top of it. You might have a trusty old spanner you swear by and that’s fine, but when it packs in mid-job and you’re an hour from the nearest shop you’ll kick yourself. Double up on smaller stuff and make sure the bigger stuff is well looked after and you’ll be able to keep on top of your game and never get caught short with a dodgy tool.